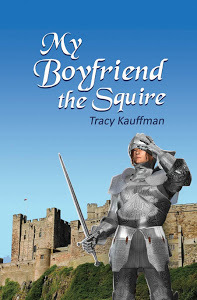 My Boyfriend the Squire is a young adult fiction fantasy that will keep the reader guessing on what will happen next. It is a romantic tale of one girls guest to help a countess to free the spell of the king over her and her daugher, Princess Grace. Synopsis: Lucinda is on her way to see her brother in Italy, when she is transported back in time to the Middle Ages. She is mistaken for a young princess named Grace. King Charlemagne has done something to the princess and his wife, Countess Hildegarde. The Countess prays for deliverance of her and her daughter. Lucinda is brought back to help the countess, since she is the spitting image of Princess Grace. She meets a young squire training for his knighthood and falls for him. He helps her in her quest to free the king’s hold on Countess Hildegarde and the princess. Lucinda returns back to the present day to meet Chad, a friend of her brother’s. She thinks that he is Chadwick, but discovers he is one of Chadwick’s ancestors. They fall in love, but then tragedy strikes. Can Lucinda and Chad’s love stay strong through trials of her brother’s death? Chad taught Lucinda how to play the perfect part of Princess Grace. Lucinda still couldn’t understand why she looked so much like her. Where was the real Princess Grace anyway?……..
Chad worried that King Charlemagne might suspect something, but he never said a word. The king barely spoke to his own daughter, even though she lived at the castle with him. He had more important things to do, like dictate his rule and leadership over his knights. At dinnertime, Lucinda tried to speak as little as possible. She didn’t want to draw attention to herself. The king wouldn’t look at her at dinner, as if he was afraid to. It appeared that he was caught up in more pressing matters, like protecting his kingdom from invasion of the Turks. Previous Finding Your Passion! Next Fulfilling your Purpose in Life.